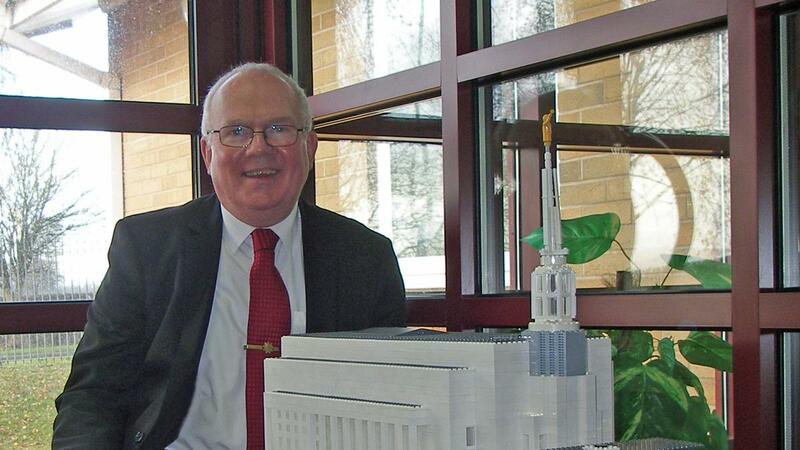 In late 2014, Bishop Beharrell set the Shrewsbury Ward a challenge to ‘Look to the Temple’. In 2015, I and some of my students at Cruckton Hall School, (a private school for boys with autism spectrum disorders), near Shrewsbury, built a 1/40th-scale LEGO® model of Cruckton Hall. In the autumn, the model was included in a ‘Brick City’ exhibition in Shrewsbury Museum, where it was seen by thousands of visitors. In 2016, my setting apart as a worker in the Preston Temple and subsequent trips with a 12-year-old friend for her first visit to the temple and then her first youth baptistry session inspired me to apply the skills and experience I’d gained in 2015 to the construction of a 1/100th-scale LEGO model of The Preston Temple. The model was on display in the foyer of the Shrewsbury Chapel, where it was of great interest to visitors and ward Primary children, inspiring them to ‘Look to the Temple’. The only non-LEGO part in the model is the Angel Moroni, which I obtained from the Latter-day Bookstore in Chorley. A few of the LEGO elements aren’t available in white, so my stepson Richard Tong spray-painted them for me.